If ever the splendour of a place was proportional to the difficulty in arriving there, then the Togean (or Togian) Islands must surely be towards the top of the list. Tiny rain-forested islands, encircled with blissful white sandy beaches, and lapped by calm clear waters, rich with coral and colourful marine life, await those who make the long journey. The speckle of over 50 islands were formed by volcanic activity and sit in the vast deep Gulf of Tomini. Thanks to the almost encircling sprawling limbs of the Indonesian island of Sulawesi, the waters are unwaveringly calm. We had taken almost a week to even get close to the islands, weaving our way north from Sulawesi’s capital, Makassar, relaxing on the white beaches at Bira, witnessing the bizarre funerary practises of the Tana Toraja regency, and taking in the tranquil surrounds of Lake Poso. Though Sulawesi’s smaller regional airports have plans to open up more regular internal flights, few travellers reach the Togean Islands without following this fascinating but slow route at some point. After a night in the low slung, gently bustling port town of Ampana, we boarded the morning speed boat bound for Wakai, the main port for the islands. Hatches closed and sweltering inside with thirty or so companions, tourists and locals in equal number, the engines fired up. We skipped and skimmed the azure sea at speed for a couple of hours, before weaving slowly through the peripheral outcrops and tiniest uninhabited Togean islands into Wakai. 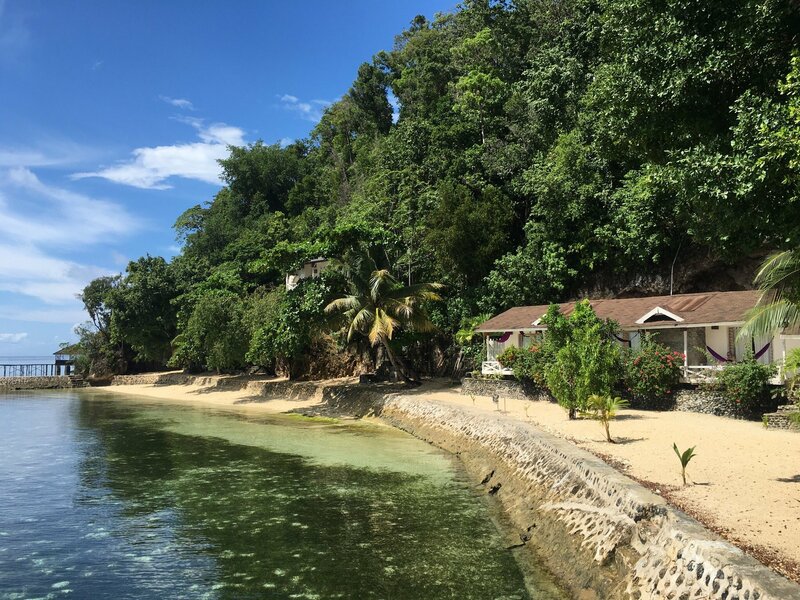 The Black Marlin Resort on the nearby island of Kadidiri was our home for the next three nights. The resort were ready and waiting at the port with a small, slightly rickety, speed boat with which to whisk us the final 30 minutes to their stretch of paradise. Nestled on a slim beach, the resort sits against a steep foliage clad rock face. Painted white and maturing gracefully, the flank of small wooden chalets each have patio doors opening onto their own veranda, complete with seating and hammock, and descend a few steps to the beach and the shallow bay, teeming with sea life. Once settled in, your life choices are luxuriously simple: dive, snorkel, read, or snooze. With all but the faintest flickering mobile phone signal, you are truly off the grid, so enjoy it. The resort markets itself as an eco-resort, though the lack of running water and electricity for all but a few hours each day is frustrating and seems more to do with the incredibly remote location, devoid of infrastructure, than an affinity with nature. The daily routine of up early, breakfasting, snorkelling or scuba diving, lunching, snorkelling or scuba diving again, and recounting the day’s exploits over cold beers of an evening was all too easy to adopt. Given the trickle of tourists who make it to the Togeans, and the small number of locals, the reefs are in immaculate condition. The sheer variety of underwater topography is enough to keep visitors enchanted for days on end: coral atolls with deep vertical walls, barrier reefs, coral gardens, fringing reef slopes; all populated with vast arrays of colourful marine life, large and small. As we took the dive boat out each day, I stared down, able to see clearly down the twenty metres or so to the sea bed, such is the water’s visibility here. Each dive guaranteed clouds of fish, a kaleidoscope of colours, flitting around walls of giant corals. Turtles, bump headed parrot fish, snapper, scorpion fish and larger schooling fish would all make an appearance more often than not. I was becoming blasé about diving amongst such riches and jumped at the chance to dive the wreck of a WWII American B24 bomber, which had ditched in shallow waters with engine failure. The crew all survived with cuts and bruises, safely swimming to shore. Their plane eventually sank just off the coast and makes for a fascinating, if silty, dive. After four glorious days, we could have happily turned our stay into fourteen or even forty days. Our journey onwards was beckoning, however: the twelve hour overnight public ferry heading north from Wakai at 5pm, arriving at 5am into Gorontalo in north of the mainland. There were mixed reports on the quality of the seating, let alone anything horizontal masquerading as a bed, for the overnight crossing aboard the ‘Tuna Tomini’. Noting our concern, one of the staff at the Black Marlin came into his own. Having taken us to the port in a small speed boat, he awaited the arrival of the ferry with us. As the metallic hulk of the Tuna Tomini slowly moored up and dropped its car ramp, we were quickly led aboard. On the car deck, already filled with piles of timber, sacks of goods, and mats with picnicking families, were led to a chap in a resplendently white uniform. With an impatient queue forming behind us, and after much signing of lists, paying for and receiving of tickets, we were led briskly up into the ship, to the bridge. Our man knocked, the door to the bridge was answered, warm words exchanged and a receipt from the Black Marlin handed over. Next to the bridge was the captain’s own cabin, with a lot of his belongings neatly stowed away. This was to be our private, air conditioned quarters for the over night crossing; a veritable AirBnB at sea. By the time the boat had inched passed the last of the reefs and islands, the sun had set and our fellow passengers had settled in. On the car deck, it remained awash with piles of people and cargo. Two or three ferry operatives wrestled a huge tarpaulin to cover a large pile of timber, given the sides were completely open to the elements. One level up were the main passenger compartments. Again, open in large part to the elements, tarpaulin curtains flapped in the breeze. It was a bun fight for passengers between airline style seats or bunk beds the size and comfort of gym mats. Well-lit throughout and with a TV blaring, sleep would be in short supply here. I put a nose inside the First Class compartment, looking out over the bow of the ship. It was air conditioned but airline style seating once again and I was none too jealous of the folk therein. Finally, on the open upper deck, a little to the rear of our cabin, the younger ebullient travellers, whose like we had not met on our trip thus far, were in full swing: beers flowing, music playing, clothes hung out to dry along the railings. We slumbered reasonably well in the captain’s beds, not least because the crew, at precisely midnight, had told our partying neighbours on the open upper deck to cease with the music and the revelry. Though the crossing felt relatively smooth, the reverberating sound of the bow crashing against the waves suggested we were carving a course through high seas. A 2am wander to the open deck, tip-toeing through the dozing remnants of our ebullient young friends, proved that the seas were, in fact, dead calm that night. A rougher crossing, I would not have wished to see. By 5am we were docking in Gorontalo, back into the madness of hawking taxi and rickshaw drivers, officious port staff and jostling sleep deprived travellers. There is an adage which says the journey itself is as important as the final destination. For the stunningly remote and untouched Togean Islands, the journey is important; it is an important little test of whether you deserve to share in the Togean’s idyllic riches. Togian Island is one of the last untouched places in the world for relaxing and holiday.